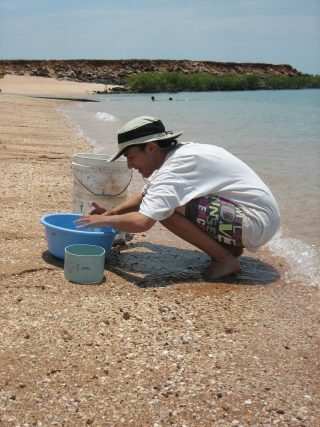 One of the main objectives of the project “Effects of Nutrient Enrichment and Toxic Lyngbya Blooms on Benthic Invertebrates and Migratory Shorebird Communities of Roebuck Bay Ramsar site” is to determine the extent, duration and intensity of the cyanobacteria blooms in Roebuck Bay. To achieve this objective, we designed a field assessment on the Lyngbya bloom extension and intensity over two years. Twelve transects were set perpendicular to the coast and every 100m, three quadrants of a known area were sampled. Nine transects were set between Fall Point to Dampier Creek and three transects set between Town Beach and Simpson’s Beach. In the lab we calculated the Lyngbya majuscula biomass of each sample. An aerial reconnaissance of the Bay when the Lyngbya bloom was at maximum extension (Feb 2012) was carried out. The flight followed the coast from Crab Creek to Bush Point. In the 2010-2011 wet season, the mapping was carried out in Dec 2010, Feb and Apr 2011. In the 2011-2012 wet season, mapping was in Dec 2011, Jan, Feb, Mar and Apr 2012. In the wet season of 2010 a visual reconnaissance only of the study area was done in February using DEC hovercraft. Some reference samples were taken. The maps indicate that Lyngbya blooms reached a maximum extension and intensity in February each year.